But still not finished. 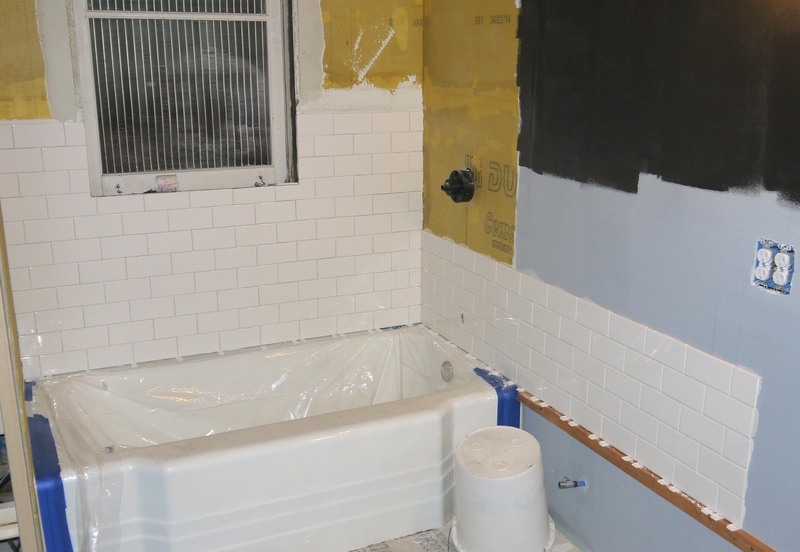 I must have put in the equivalent of 5 full 8 hour work days over the course of last week, doing any last minute prep and then tiling the shower surround and bathroom walls. As far as last minute prep: I caulked the seam around the window opening between the cement board and old window frame (which becomes the rough opening for the new replacement window) and then painted the waterproofing membrane over top once the silicone was dry – one cannot be overly waterproof. I also caulked the joint where the cement board meets the tub, running my finger along the bead of silicone to make sure it wouldn’t dry proud of the cement board and effect the tiles adhering flat. And then it was time to bust out the wet saw and mix up mortar. I also purchased a manual tile cutter, because I thought it might be faster for straight cuts on these small tiles, but a wet saw is the only way I know how to cut corners or grind rounded shapes in a piece of porcelain tile. And sometimes I just need to shave the slightest sliver away from a cut, and the wet saw is the best for this also. For mortar, the tile store sold me Full Flex Premium thin set mortar. 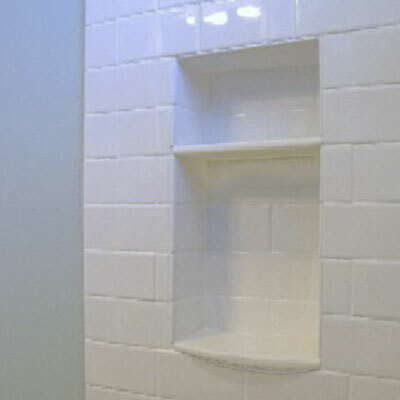 They explained that it would be the best product to use for everything – the shower walls, bath walls, and floor. I roughly followed the mixing ingredients, until it was about the thickness of cake icing. Although the professionals will trowel it onto the walls in a small section at a time, I kept finding it would dry too quickly that way (lots of cutting tiles, then re-cutting tiles, and before too long the mortar wasn’t sticky any more). So I switched to using the back-butter method, where I lather up each tile, scrape with a notched trowel, and then push the tile into place. It goes slower, but I felt it was cleaner and gave me more control. The large areas went fairly quick. 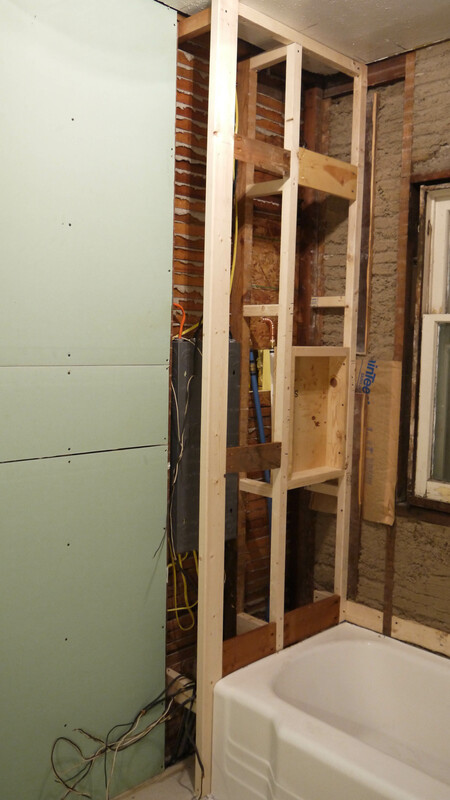 I started with the tub side wall, under and around the window. Rather than get fancy with the corners, I simply tiled the side wall all the way to the corner and then butted each row of the front and back wall up against the corner once again. 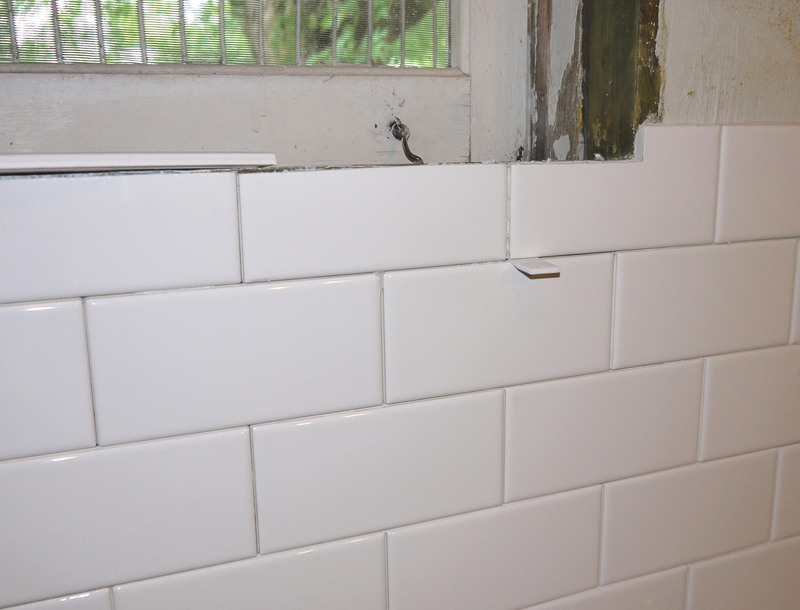 Once its all grouted, it will just be a straight line in the corner rather than a weave that a professional might make by doing one row at a time and alternating each row. Above is the closeup of the corner. I also left an 1/8th inch gap between the bottom row and the lip of the tub, as instructed by the TileMasterGA via YouTube. 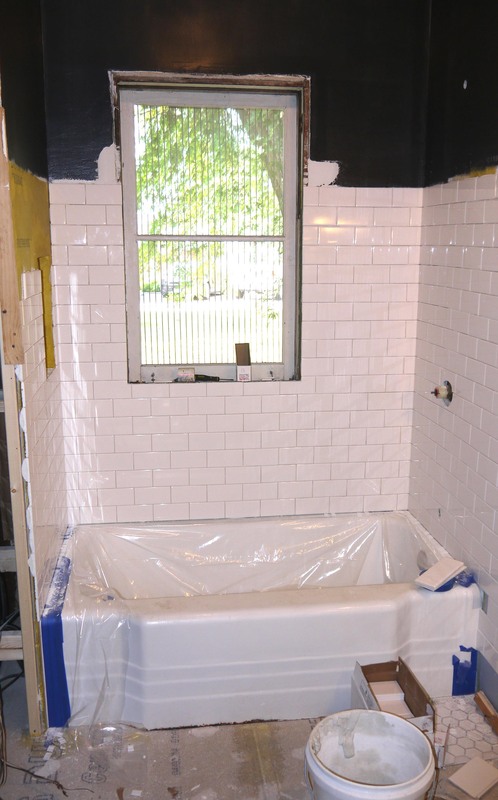 Rather than grout this line, it will be filled with white silicone to seal the space and create a waterproof line so water cannot get beneath the tile or behind the tub. 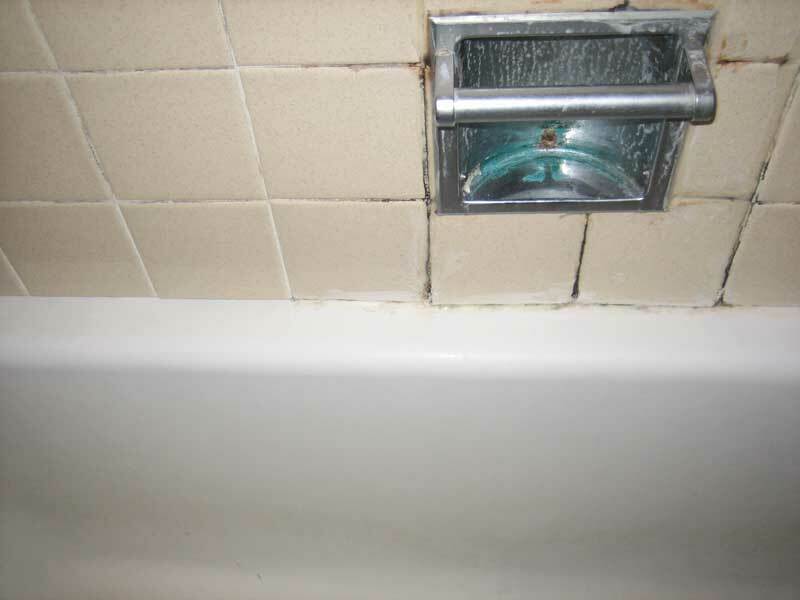 The wood trim attached to the wall provided a straight edge to begin tiling this wall, level with the ledge of the tub. 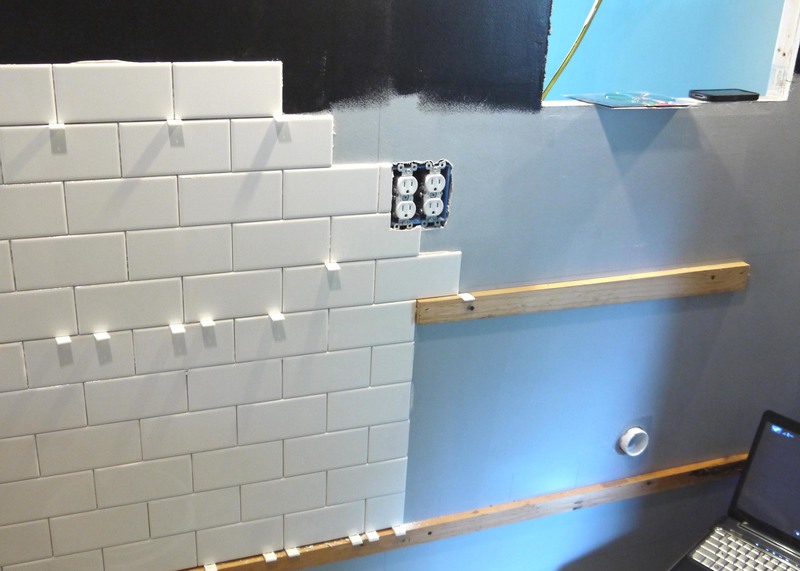 This way, each row would meet in the corner and the grout lines would be aligned. The second wood piece is just slightly below what will be the top edge of the vanity cabinet. Since I expect the cabinet to be pretty permanent, I went all cheap scape and decided I didn’t need to tile the area that would be hidden behind the cabinet. 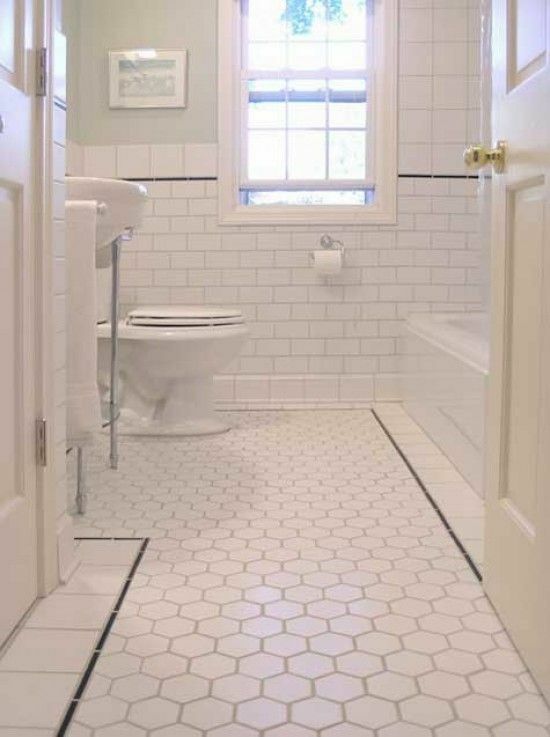 Seemed like a waste of tile and time. Around the window, I cut the ties flush with the inside edge of the wood frame. The new window will be a snug fit inside this frame, and once the window is installed I can place the marble ledge for the window sill and use bullnose edge tiles up the sides to finish the inside edges. It took several long days, hundreds of trips outside to the wet saw to cut (and then re-cut – and then cut my fingers on sharp edge of the tile), but the large areas went pretty fast. 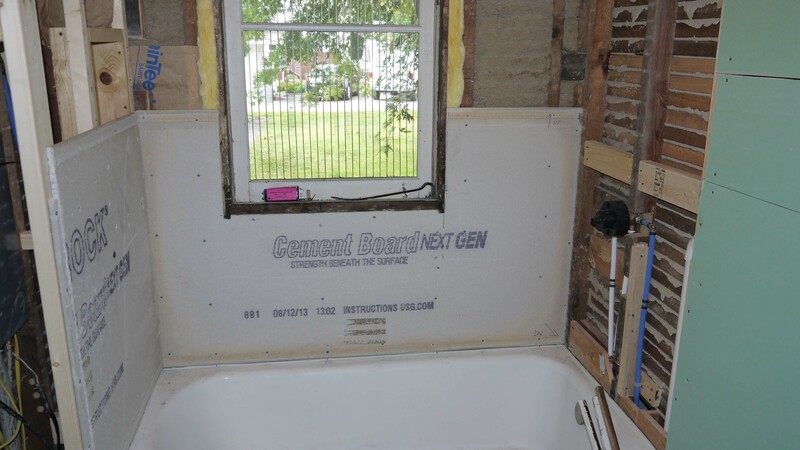 Meaning, drywall and cement board! 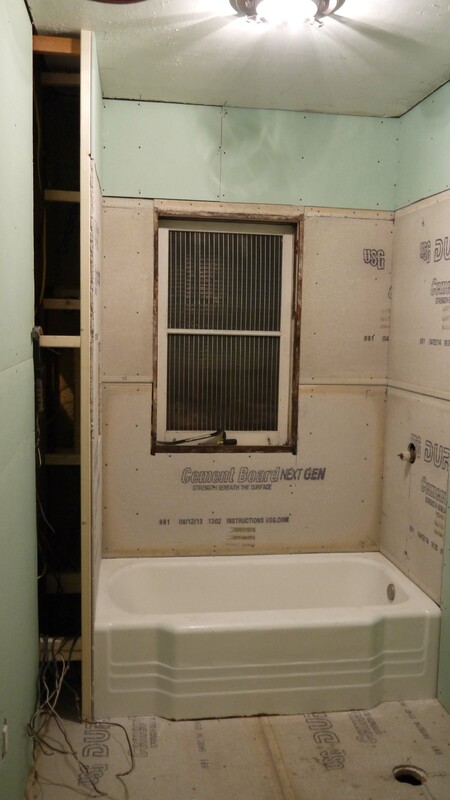 Although most of the bathroom was ready to accept wallboard once the plaster was torn off, I did have to do a little framing at what would be the back of the tub/shower. 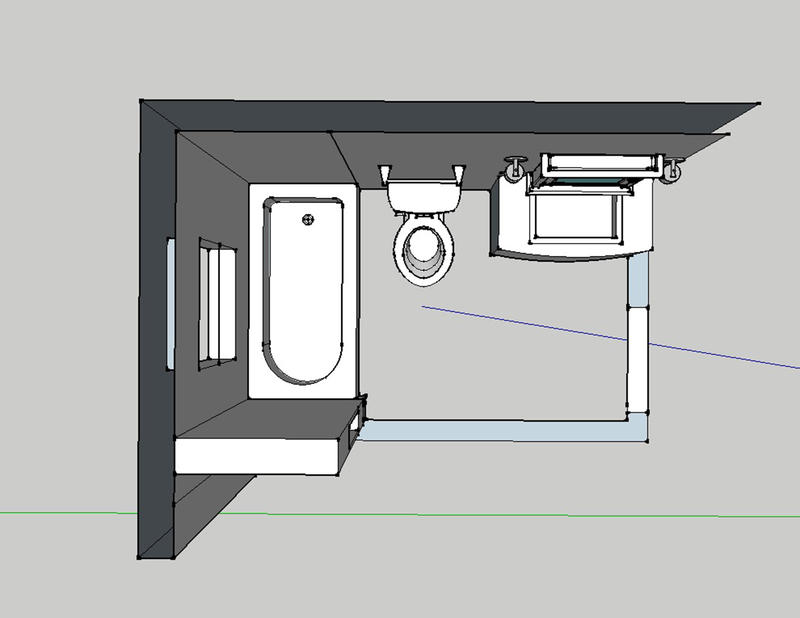 As you can see in this 3D model, the bathroom is about 5′-8″ wide, and a tub is only 5 feet. That leaves me with a 8 in gap between the tub and the existing bath wall. 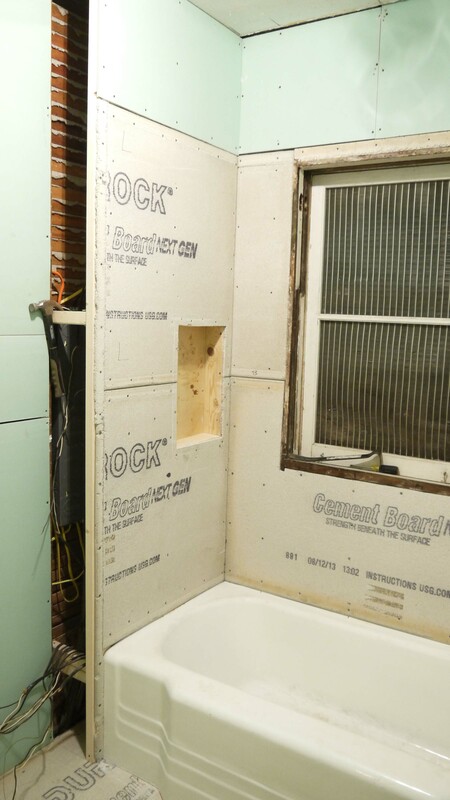 So I framed in a full height wall to have a support to build a shower wall. In the end, I’m planning to trim it out with little cubbie cabinets to look very similar to this (only I will continue it all the way to the ceiling). I used 2×2 lumber as the main section, and a 2×4 on the outside for strength (non-weight bearing walls can be constructed of 2×2 lumber – it’s how thin walls and even walls that house a pocket door are constructed). I added lots of cross-supports between the studs and the wall behind. Although it was very strong on it’s own, this will be a tiled shower wall, and I don’t want any flexing to crack tiles or cause them to break off. The 1×4 sections between the studs are flush to the front of the framing studs. Just like the ones you can see along the top edge of the tub, these were a recommendation from a how-to video I found very informative on YouTube (Seriously, TileMasterGA: I have learned so much from his many videos documenting each thorough step of a quality and long-lasting bathroom renovation). These boards he recommended are to provide additional support to secure the wallboard as strong as possible, minimizing flexing. I just used scrap boards for these pieces. I also put them at the height where 2 sections of wall board will meet, to make sure the joint has this strong support as well. So back to reality. Wall board goes up pretty quick, and relatively easy. The only bad part is lifting the 2nd sheet up to the ceiling and holding it while driving the first couple screws to secure it. Oh, and don’t forget to pre-measure & mark the location of outlets, light fixtures, or pipes. That meant taking the one sheet back down to measure, and then lifting it up and securing it all over again. Marking the location takes a lot of the guesswork out of using a RotoZip to cut out for the opening. The cement board went pretty easy too. It comes in slightly smaller pieces (3’x5′ instead of a regular drywall 4’x8′), so it’s easier to handle and lift on and off of sawhorses. Cutting the cement board is not as easy as cutting drywall. Instead of scoring with a utility knife and snapping it apart, I used a metal cutting blade in my handheld jigsaw. It did a little tearing out along my cut line line (after all, there are pieces of aggregate compressed into the board just like in cement), but it’s a raw edge so that’s ok. 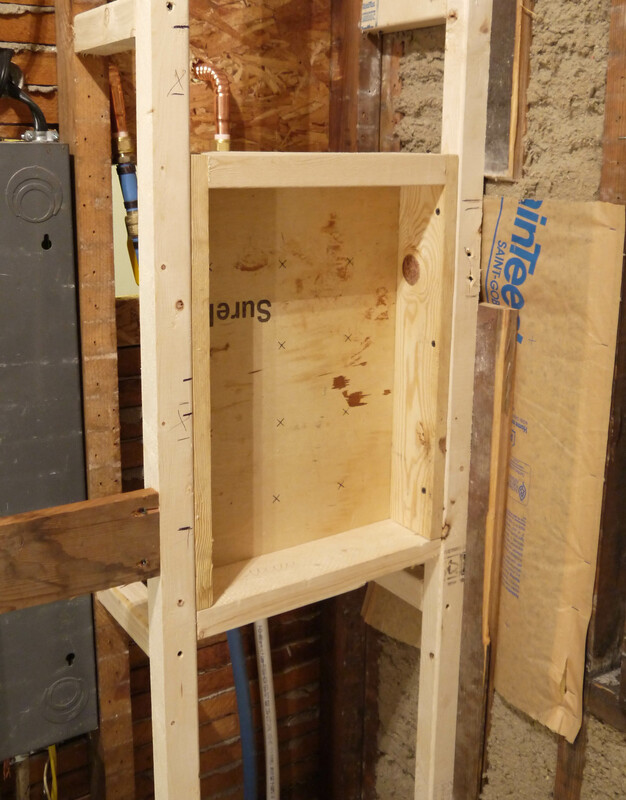 I didn’t have any trouble drilling holes for the tub and shower faucet or the mixer valve. I just used the matching size hole saw bit and it went through just fine. For attaching the cement board, the lumberyard sold me special ‘cement board’ screws that are recommended. They have different threads than drywall screws and a larger head, which prevents them from pulling through the surface too far. 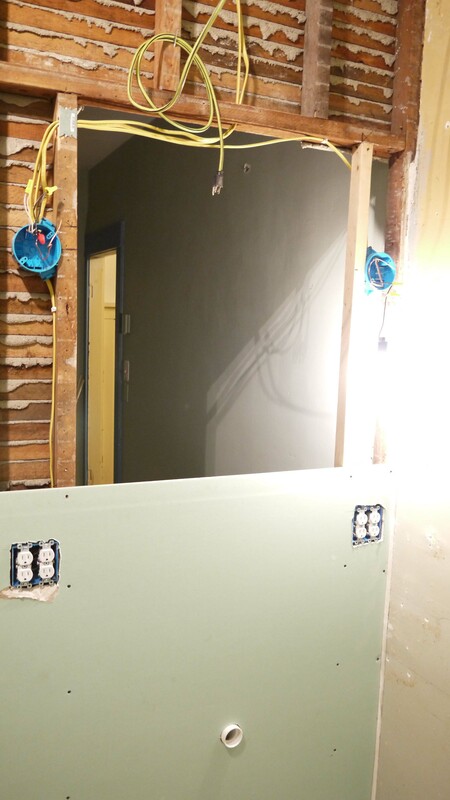 They barely countersink themselves and that holds the cement board tightly against the wall studs. 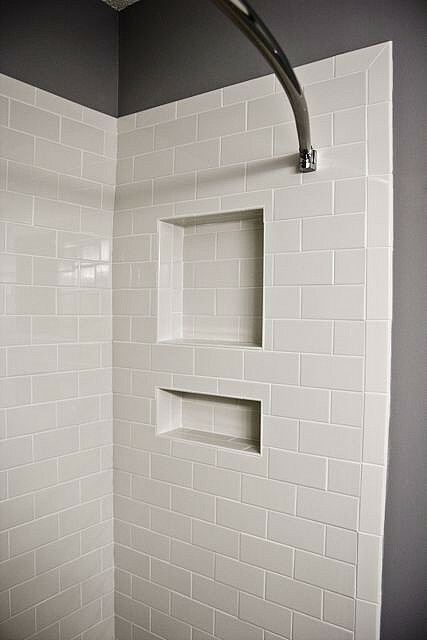 Same as the floor, the shower walls are super string and rigid, and just about ready for tile! I can’t even begin to express how good it feels simply to have walls again! Oh, except the niche. I still have to cut the smaller pieces to fit inside that area. Don’t look for regularity in the screws. There isn’t any. I put a screw wherever I felt it needed one. And especially don’t count how many holes there are without screws. Screw guns are so finicky + extremely hard old-growth lumber wall studs = a lot of stripped out screws. But the next step should fill and cover all of those. Bring on the mud! 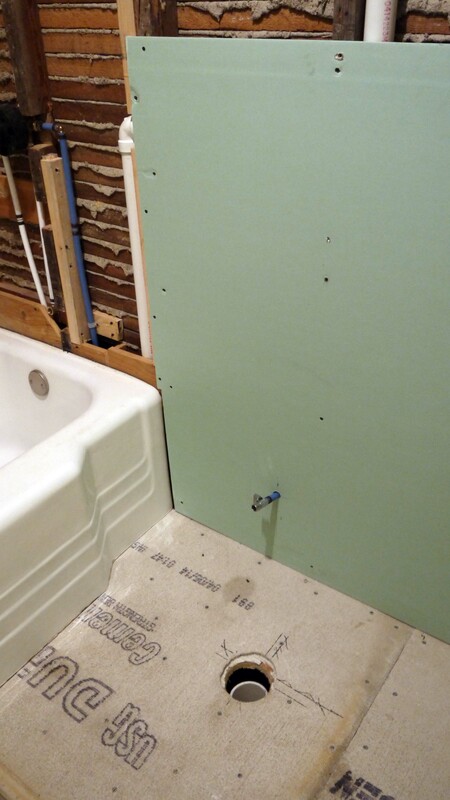 As the title suggests, this post refers to the next step in finishing the bathroom floor. Because it involved laying down material, I really really wanted to title it “Getting Laid,” but my better judgement stepped in and changed it. Oh well, perhaps a future title. What I laid was cement board. 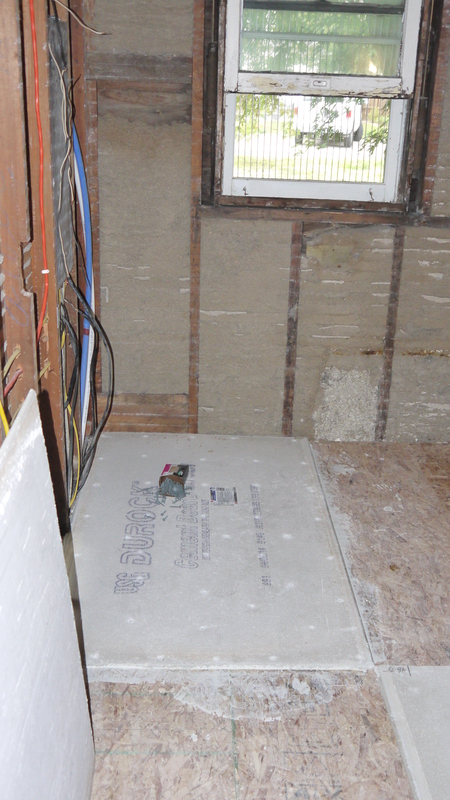 To achieve the 1-1/4″ total subfloor thickness before I can lay the finish tile floor, I put down 1/2″ cement board over the 3/4″ OSB I installed a few weeks ago (read about that huge step forward over here). 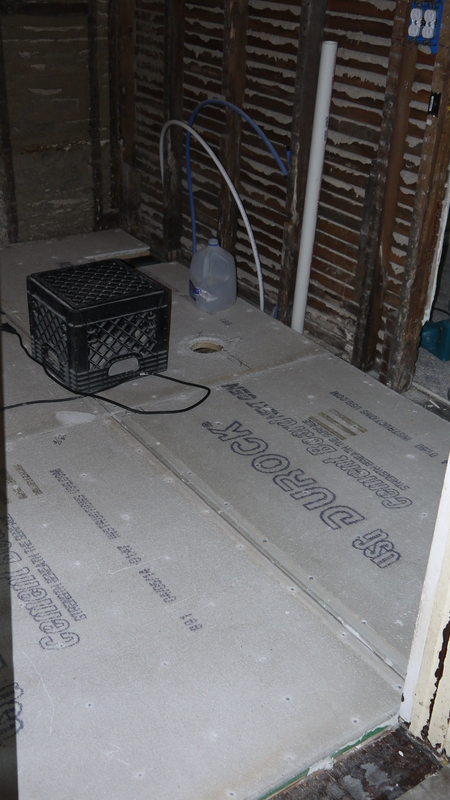 The Durock Next Gen brand cement board came in 3′ x 5′ sheets, so it took 4 total to cover the entire floor. I purposely arranged them in a way that they would overlap the joints of the OSB underneath, so not to have seams directly on top of one another. First I dry fit each sheet, cutting them to size and then cutting out the hole for the toilet drain and tub drain access. 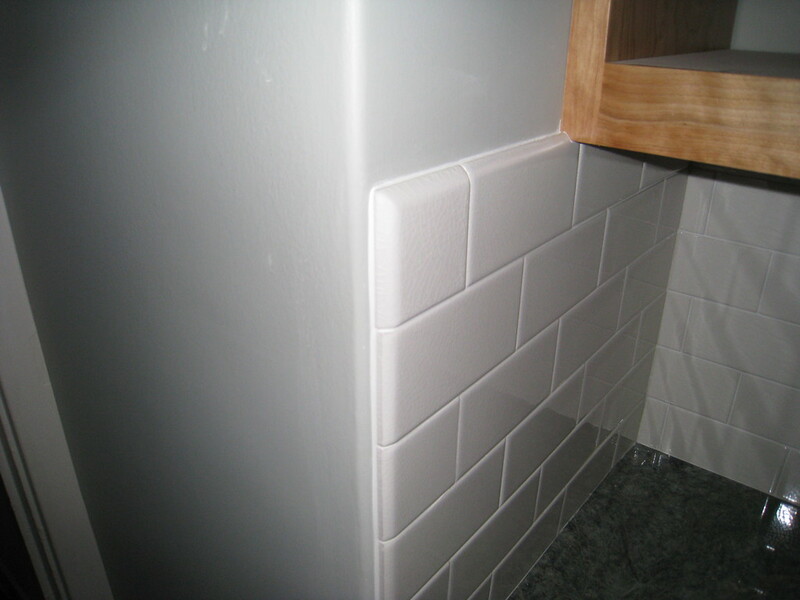 While some sources say to simply screw the cement board into place, a professional contractor here in town advised me to set them into mortar thinset, just the same as if I were laying the finish tile floor, and then screw down into place. Why? He said imagine the two layers of subfloor as if they were two regular pieces of lumber. If they are screwed together, the two boards are stronger than they were apart. But if they are laminated together, they are even stronger yet. The same for the cement board and OSB underneath: using mortar thinset “laminates” these two layers together, making the subfloor stronger and less likely to move or flex (which is what causes a tile floor to crack or grout to crack and fail). I used a trowel to spread the mortar about 1/8 – 1/4 inch thick on the floor, in a square just large enough for one sheet at a time – this is so I wasn’t stepping in the wet mortar. Once I felt I had an even bed of mortar, I used the notched trowel to make ridges and then carefully laid each sheet down, making sure it was pushed flat against the outside wall studs. I placed screws every 8 or so inches apart, on a grid across each cement board, maybe more along the edges of each board. 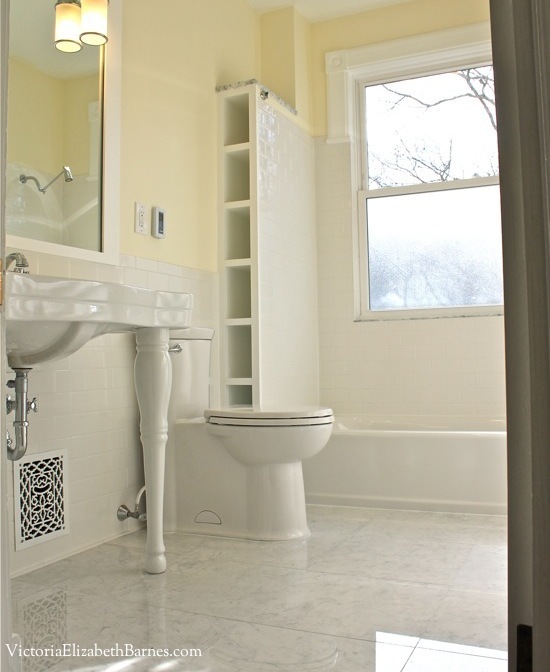 Unfortunately, the bathroom floor will be about 1/2″ taller than the kitchen floor where they meet. Not ideal in my book, but a custom threshold strip stained to match the wood floor in the kitchen should make a nice transition. So now this floor is ready for tile! Onto the walls.